Facebook posts with images have 2.3 times more engagement than posts without images. The power of visual content is undisputed. However, the efficient production of high-quality digital content is full of pitfalls since it often involves different experts at every stage of the process. In this article, I’ll share the most common pitfalls with you. But don’t worry too much about them, since I’ll also tell you how to avoid them. 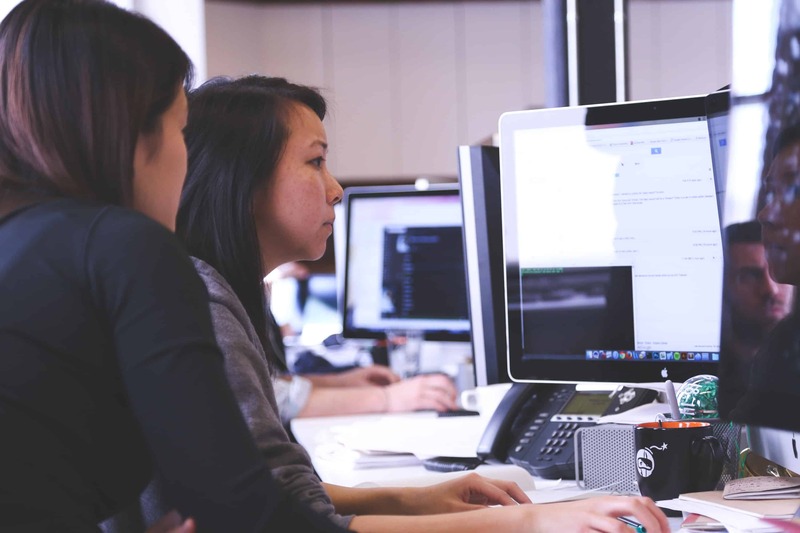 Collaborating on digital content requires regular communication with your team. Often times, this kind of communication workflow isn’t optimized, and the communication channels you’re using such as managing the creation of a video via email is just not very effective. If you’ve ever collaborated on a video project with an agency, you know that the preferred channel for discussing change requests is still email. Sometimes, the agency won’t understand all of the changes right off the bat, and will ask for clarification. This back and forth wastes a lot of time and resources, and it’s not completely unnecessary. Assess and optimize your communication flow. For example, you should use software like Lucidchart or Google Slides to house your existing communication flows. But before taking any action, you’ll need to know about the status quo. Which processes are causing problems? How can you improve these processes? Let’s dive into the previous example again. One huge problem is that you need to spend a lot of time reviewing and approving your cycles. This problem is caused by the process of defining and clarifying your change requests via email. You could improve this process by switching to another communication channel such as Slack, Flock, or Chanty to increase the response time. Usually, when you’re creating media files such as promotion videos or infographics, there will be several review and approval loops before you decide on a final version. But if you have no clear way to manage the different versions of a file, you’ll have a mess on your hands. The worst-case scenario is that different people are working on different versions of the file, and don’t recognize it. 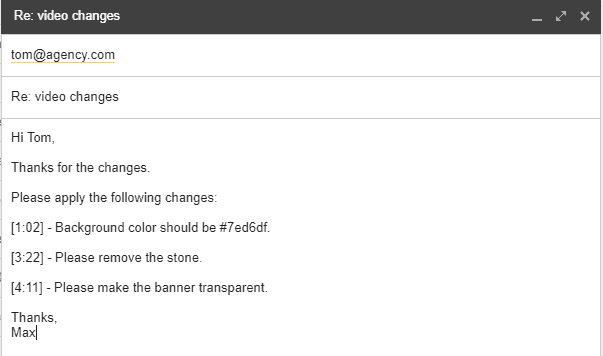 Hence, it can be quite annoying to respond to multiple questions every day that ask for the current version of the visual file. Find a way to make sure everybody is always on the same page. At every phase of the project, everybody needs to have access to the file version that’s currently being used. The purpose is for constant transparency, which can involve using a suitable digital tool. If you’re creating a lot of visual content, you can consider exploring digital asset management software such as Libris or Widen Collective, which will help you manage and centralize all of your visual assets. Apart from using a software, you can also introduce naming conventions and a common folder structure to make sure everyone is working on the right files. Let’s make an example for a design project. That way, you’ll be easily able to identify the latest version of a file and make sure that everyone is on the same page. Crafting valuable digital content requires a lot of effort and different skill sets. To create an infographic, you’ll need a designer, a copywriter, and a marketer. Each of these people will need to know exactly what to do during each phase of the project. If the copywriter doesn’t know that he need not wait for the designer because the marketing manager didn’t tell him, your whole process can become an inefficient waste of time. To inform everyone involved about their roles and responsibilities, set up a kickoff meeting before commencing work on the content. Take meeting notes, so everybody can look them up whenever they need. Also, break down all tasks, define due dates, and come up with a timeline. Make sure that all team members know their assigned tasks and deadlines. You can use project management software such as Asana or Trello to create tasks, make assignments, and set deadlines. Or you can use software like Filestage, which reviews and approves digital content. The big advantage is that everyone involved will know about their jobs, and will be able to check the project’s progress at every stage. Creating a great promotional video can take a lot of time. It’s definitely better to invest more time into creating an excellent video than producing a half-finished video that nobody wants to watch. But the process of getting to this stage needs to be well-structured. If the marketing manager isn’t sure about the objective of creating a visual piece, the outcome will likely not meet the expectations of the audience. Hence, it’s important to clarify that upfront. Steering blindly without having any clear milestones will likely result in confusion about the current progress. Even worse, you could gradually lose track of the project plan, which will become less and less clear if you’re still heading in the right direction. So before commencing your work on the project, define your objectives and milestones, and clarify your related ownership and timelines. 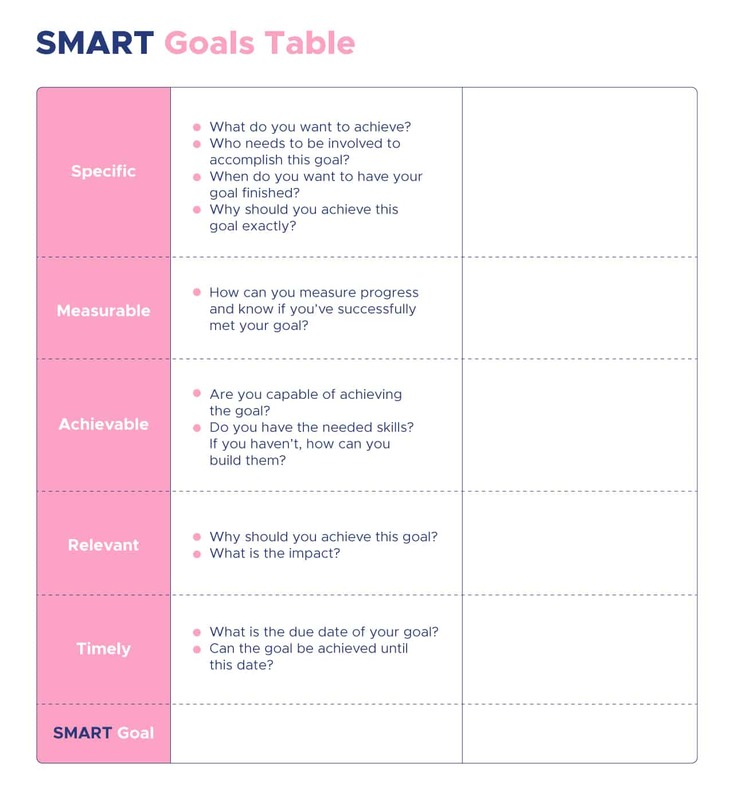 Use SMART goals to clearly define proper objectives. In other words, your goals should be specific, measurable, achievable, relevant, and timely. By following this approach, you’ll make sure your objectives are as clearly defined as possible. If you’re unsure how to start, get inspired by these 20 SMART Goals examples. In addition, you should set project milestones to break down your major goals. They will help you make sure that you stay on track, while heading towards your big objectives. For example, if you’re creating a new series for your YouTube channel, a milestone could be “the first video was finished” or “the first video was uploaded.” Milestones always describe the start or end of an important phase or decision. When collaborating on media content, it’s important to share a common goal. All team members need to work towards a similar outcome. If not, everyone involved will pull the project in different directions. For example, if the marketing manager didn’t tell the designer that she wants to target marketing executives as a target audience, the designer will just assume that the digital content should be based on his/her individual expectations. it’s very important to clarify the scope from the beginning on. Before working on your visual content, create a creative brief. The purpose is to answer all related questions before putting a lot of effort into the creation. 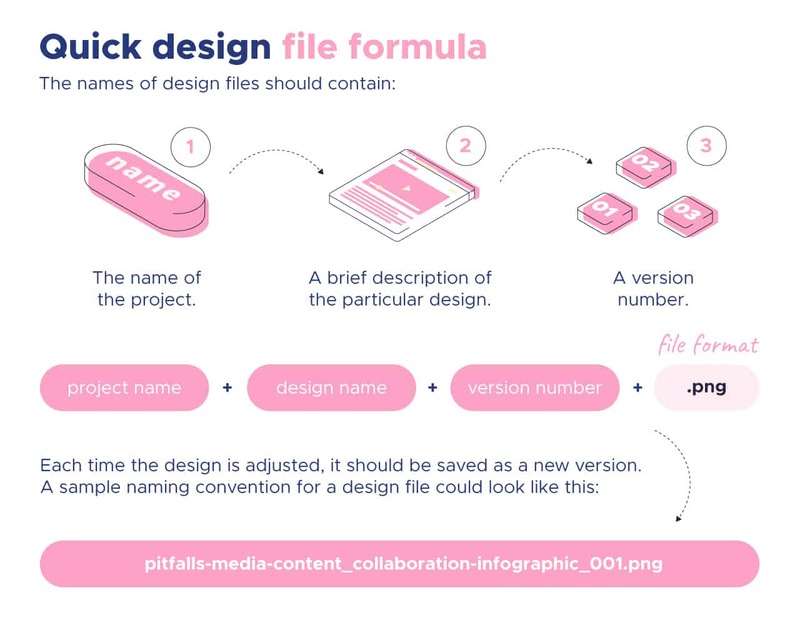 Below is a creative brief that Piktochart created for one of its freelance content creators, completely with SEO justification, deadline, and article structure. Use the kickoff meeting to clarify open questions that weren’t answered by the creative brief. All involved people should understand the goal of the project, and should be on the same page. Using Excel spreadsheets for managing your digital content production is possible, but it’s also quite cumbersome. Manual workflows, such as creating the timeline for the project in Excel, or assigning tasks via email, can result in a lot of small, unnecessary tasks that harm the project’s performance. So you should think about finding ways to automate these processes. Create a detailed list of all tasks. This task list should include information about the owner, requirements, and needed approvals. Now it’s time to find a software that helps you automate these steps. Obviously, the software depends on the workflows you want to automate. 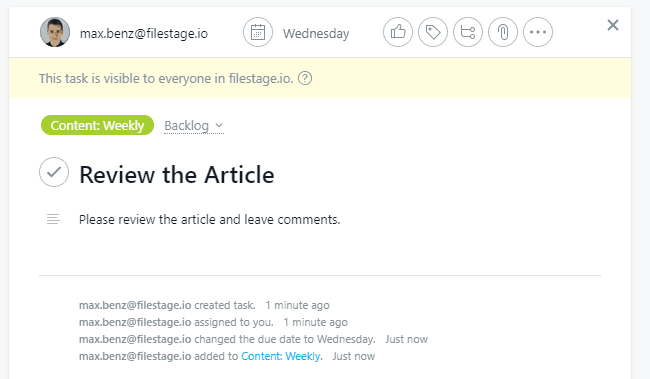 For example, if you want to find a solution for managing your content pipeline and to easily assign tasks, consider using project management software such as Projectmanager.com or Wrike. Or you can use a directory such as G2Crowd or Capterra to find the best software that fits your needs. These directories offer a broad range of categories, and allow you to easily search for the right solution based on your manual workflows. Before diving into an ocean of software solutions though, remember that the first step is to define the problem – so take the time to do this. When evaluating the problem keep in mind that the purpose of introducing new software is crucial. Implementing a new software doesn’t take a lot of time but getting your teammates to use the new tool does. To achieve that, you’ll need to create new habits in people which can be quite time-consuming. Software works both ways. Although I’m recommending a lot of tools in this article, always be clear about the purpose when introducing new software. Often, the various people who are involved are already using different tools when collaborating on media content. The number of tools you use should positively correlate with the effort needed to manage them. The more tools you use, the more effort you’ll need to manage them. Your copywriters use Google Docs to share their texts. 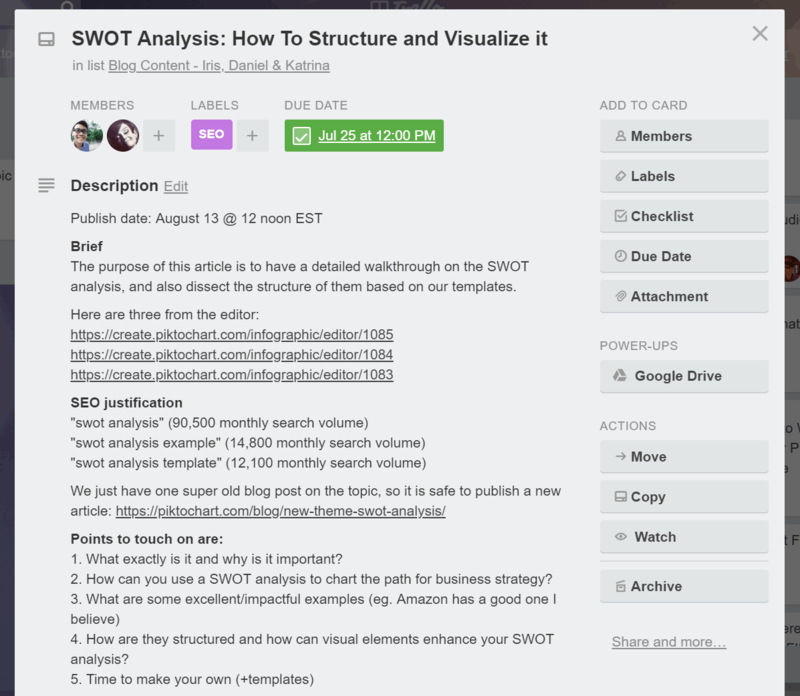 The marketing manager uses Asana to keep track of all tasks. The whole team uses Slack to communicate with each other. So you’re already using four tools, which results in four different information silos. Assess your tool situation, and create a list of all used tools. Afterwards, analyze the tools you’ll need. Then figure out if you’re missing any integrations between the different software solutions. If you are, use a service such as Zapier to make sure they’re connected. For example, if you’re using Slack for communication and don’t want to regularly check all completed tasks in Asana, simply integrate your tools with each other. 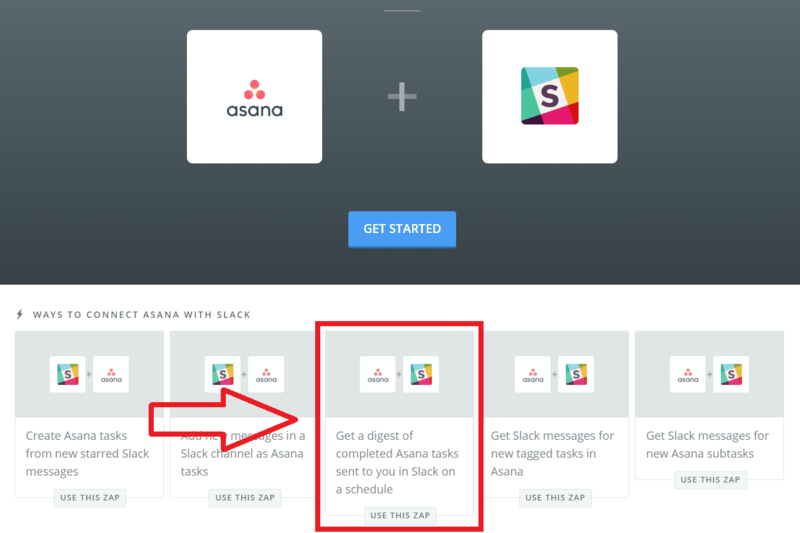 Then you can use Zapier to receive a daily digest of completed Asana tasks in Slack. That way, you’re breaking the silo structure, and both tools will talk to each other. Of course, there are endless ways to use Zapier. If you’re interested in learning more about the opportunities Zapier offers, check out this comprehensive overview of process automation Zaps. We know that when working on visual projects with your team, there tends to be a lengthy feedback loop between either your teammates or your clients. You find yourself spending hours sifting through email and Slack threads, condensing feedback from teammates and clients, as well as trying to locate brand assets such as logos and brand color palettes. Piktochart for Teams provides an easy-to-use solution to create visuals in tandem with others, to have access to the same library of images and brand assets, and to also be able to comment and make rounds of revisions – just like in Google Docs.